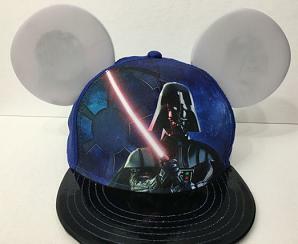 There didn't seem to be any discussion of this hack offered on his page, but the message is clear: a MWM Ear Hat was gutted and transfered into the Star Wars cap. Given the current Star Wars frenzy, this hack should appeal to a number of folks. Just wish the author had included some details of the migration. Notes: "The ears actually screw into a plastic suspension along with the battery pack. 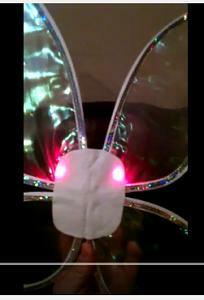 The ears are a little bit larger and you do have to make some holes to screw in the glow with show ears. 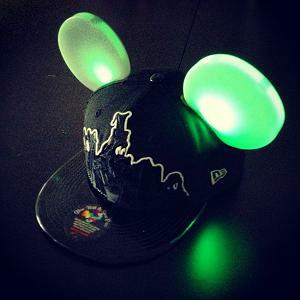 I think the hat fits a little better than the glow with show hat because it's not so domed." "I HATE THE CAP! It's one of the worst looking caps I've seen and you look like a dork wearing it. The fit is terrible. The battery box sits on the top of you head so the hat rocks because it's so top heavy. The under chin strap is a joke. 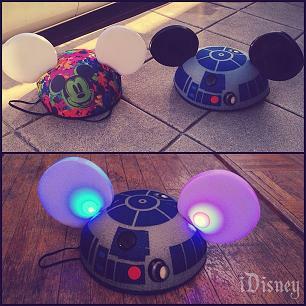 It's just very bad design and in my opinion not upto Disney standards." He gives a detailed account of this hack, which is both a welcome and an infrequent occurance! One thing done differently in this hack is the relocation of the battery pack. It's surprising that other hackers don't usually address this problem. Moving that battery pack out from under the cap provides more room and greatly expands the modifiable hat choices. A good read. Notes: There didn't seem to be any discussion of this hack offered on the containing page. 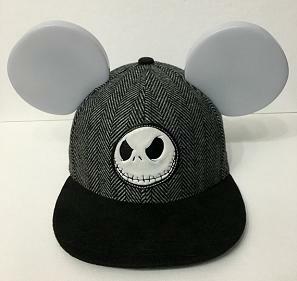 "For this hat, I added the Made with Magic ears, battery pack, chin strap and other structural supports to a high-quality Jack Skellington baseball cap. Both were brand new when I purchased them. For further embellishment, I painted Jack's face with UV reactant paint so he will glow under blacklight (for instance, while riding the various dark rides at Disneyland). I also added cut out silhouettes on the back sides of the ears. 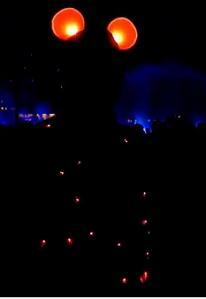 One features Oogie Boogie's silhouette from the opening scene of the film and the other features Jack and Sally on the top of Midnight Hill from the end of the movie. The silhouettes are not visible from the front and are barely visible from the back when the ears are not on. But when the ears are on, they look amazing! See video of the hat: https://youtu.be/jcin2BZ8XZI"
As you can tell, Jeff Lee is not content with making a single modification. He's making good use of more of his 'canvas' than others usually do. Nice to see. He's also not shy about cashing in on his hacks. He's offering this item for sale on Etsy. Follow the url above for details. See the hat in action HERE: https://youtu.be/T75mKCwF330"
Again, follow the URL above for more details and for purchasing info. Came across this hack by following the #DIYMWM tag on Twitter. Guessing that she used a custom Disney board that has been passed out at some conventions. "I did the electronics, and can guarantee that it isn't any sort of secret prototype. You've pretty much guessed it -- I took the electronics out of a GwS hat, and wired it to control some large LED strips. The jacket has about 150 LEDs in it, so there are separate power supplies, a bigger battery pack, and some other support electronics, but it's all controlled by the GwS hat." 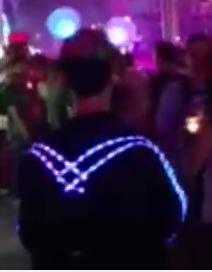 Notes: "This video shows a hack using a pair of Glow with the Show ears rigged with additional LED lights and then incorporated into a vest. We wanted to show how the vest is indeed hooked up to the ears and is in sync with the show. My dad was the genius behind this hack and he makes for a great model!" Notes: Two MWM Earhat subunits went into this shoulder bag design, along with some EL components. The instructable is thorough, even going through construction of the bag, too. A good read. Notes: No audio associated with the video? 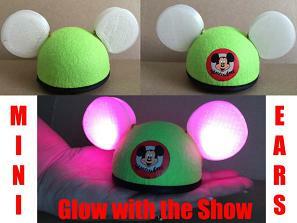 YouTube notes section simply says: "Tear down glow with the show mickey ears and make Tinkerbell wings glow with the show." This hack, unlike many of the previous hacks, starts with the MWM components from a Headband device. 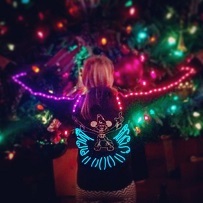 "While the wings are very cool by themselves, the real magic is wearing them at the Disney Parks (during holidays that allow adults to wear costumes, of course). 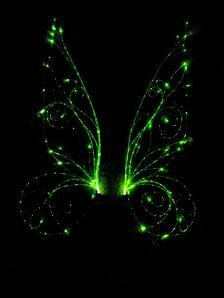 The wings are made from vinyl, iridescent wrap, wire, and sparkle fiber optic wire. 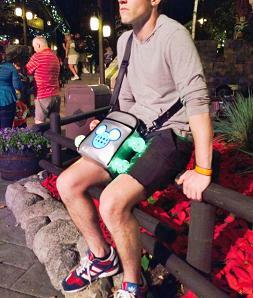 The harness is 3D printed, with the Made with Magic Minnie bows and AAA battery pack." As this is an Instructable, there is lots of good information that may be interesting to MWM hackers. Worth viewing the write up and the video. This was a slick hack. Too bad there is now a toy gun ban in the parks and this can't go play there anymore. The creator took the components from a MWM Wand and installed them in this toy. He hooked the trigger up to the 'send' button of the wand's board and fit a new button into the toy to allow selection of the patterns. When the trigger is pulled, the LEDs do their flashing thing and the current sequence is sent to the unsuspecting victim. Slick. The end result is a fully functional 'wand' in an entirely new form factor. FYI, he mentioned that the Paintbrush components didn't work as well in this hack. The emitter wasn't as effective as the one in the wand. 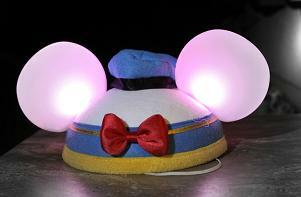 "I have miniaturized the standard Made with Magic / Glow with the Show interactive ears. 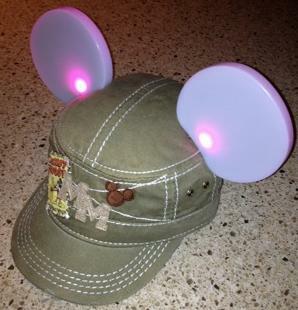 These mini hats interact with all current Disney parks "glow with the show" programming (Fantasmic, Wishes Fireworks, World of Color etc..) and work with the Magic Wand they sell. They come in their original box which includes all accessories shown." Commercially available via the URL above. The items above are a nice assortment. Good start. But, if one thinks about some of the articles that are already commercially available with blinking lights in them, it's surprising that more of those haven't been emulated with MWM components yet. Things like ear muffs, heavy scarves/mufflers, more jacket, sweater, vest items, back packs, purses, belts, toys and novelties. It's probable that some of these have been done, just not posted online or maybe I just couldn't find them. Also, it would be great to see a wider variety of the MWM devices utilized in hacks. For the most part, it's usually the Ear Hat that serves as the starting point. However, some of the other devices have distinct advantages for certain uses. For instance, the 3D castle hack probably would have been a lot of work if starting with the other devices, but was relatively easy to accomplish using the Chernabog internals. Then there's the Glove components with their attached light tubes. They seem particularly intriguing as a starting platform for certain hacks. I have a feeling that most folks simply don't have a good handle on all the possibilites at their disposal from the different MWM offerings. I'll be seeing what I can do to consolidate the info about the different devices and compare the features of each one with the rest. Maybe that will help stimulate folk's creativity. Lots of fun stuff to be created. Got another example not on this page? Register and then post a comment or use the contact link that appears at the bottom of the page for registered users. Help make this a truly useful resource for all MWM lovers!